Another month passes and at the same time, the VioVet catalogue increases. 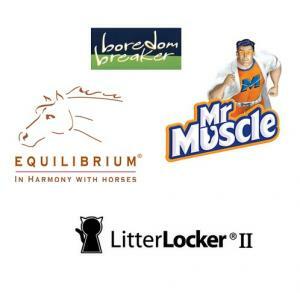 The last month has seen a variety of additions including two new horse snacks from Equilibrium to complement their popular Munch range. There is a new set of designs of dog collar available from Wag & Walk which can be perfectly matched with the new leads. A new selection of Mr Muscle household cleaners is now available for purchase, and if they are anything like their kitchen and bathroom products these are sure to be a big hit. A new bin has been created by LitterLocker to come to the aid of cat owners that keep a litter box inside the house, and a number of treats have been added to the Boredom Breakers range to suit all your small animals. Equilibrium Products have been producing their Vitamunch horse snack for a while now and it has fast become a very popular product with caring horse owners. Each Vitamunch snack comes as a solid block of Timothy hay along with select herbs, vitamins and minerals to provide the horse with much needed nutrients that they may be missing in their diet. This month has seen the range expand to include a Munch snack aimed at joints and one produced to provide calming effects on the horse. Fleximunch provides your horse with the goodness provided from the original Vitamunch, but with added Glucosamine, MSM and Rosehips, Ginger and Boswellia. Calmmunch also has similar ingredients to Vitamunch but also has added magnesium, camomile, hops, B vitamins and vervain. Both of the new snacks fit perfectly in the special Vitamunch Net which makes it easier to give your horse a healthy treat whether in the stable, yard or horse box. Wag n Walk is a brand by Rosewood that creates a number of attractive collars and leads for dogs. They specialise in producing items which are not just functional, but that look great too. This month has seen the introduction of matching collars and leads which really will make your dog stand out. The colours they use are modern and stylish, without scrimping on quality. The two ranges now available from VioVet, are the Fashion and Designer collars which have each been made available with a matching lead to complete the look. With quality like that it’s a wonder they haven’t completely sold out already. It’s always essential to ensure you are prepared for accidents to happen around the house when you have pets, and when there is such a wide range of cleaning products available how can you be sure that you will always be covered for when these little problems arise? Mr Muscle has been producing household cleaning products to help keep all the rooms in a showroom condition, and now they have expanded their range to include products which have been made specifically to combat odours and urine stains left by our pets. Whether it is the carpet or a hardwood floor that needs cleaning, Mr Muscle can help to quickly eradicate the unwanted mess. Oxy Odour Eliminator is used to banish both airborne odours and those which have set in to surfaces, whereas Oxy Urine Destroyer is used to get rid of tough urine stains while also preventing remarking. If odours and stains are both a problem then you need to look no further than Mr Muscle's Odour & Stain Remover which comes in two strengths which are aimed at either removing the stain and preventing remarking, or penetrating older and more stubborn stains. We also have the Oxy Pickup Pads which are ideal for new puppies, kittens or smaller animals which may make a mess every now and then. LitterLocker are a new brand at VioVet who bring a revolutionary item which will make life so much easier for many cat owners, especially those that like to stay indoors most of the time. The LitterLocker has been made to hygienically store your cat’s litter tray contents, without the need to take a bag out to the bin every time you change the litter. It looks a bit like a standard bin but with features that ensure it doesn’t at any time smell like a bin would. It contains a barrier seal which keeps any odour from escaping and holds a bag inside which collects up the soiled litter, ready for an occasional change over. The LitterLocker can keep the soiled litter stored for up to two weeks but it can be changed any time you see fit. Inside is a film which just needs to be pulled each time you get rid of the waste, there are no awkward rubbish bags that you have to struggle getting in the bin. On the side of the LitterLocker is also a scoop, making emptying the litter tray even less fuss. If you would like to read more about keeping a cat indoors, why not take a look at the indoor/outdoor cat debate from our blog. You would think that spending most of your time in a cage may become tiresome. Luckily for the majority of small animals a little toy can bring a lot of enjoyment, not just for the animal but the owner too. Boredom Breaker is a large range of small animal toys and treats which have been crafted to provide your small pet with objects that suit the way in which they like to play. The Carrot Dream Catcher, Loofa Hoola, Salsa Pom Pom and Salsa Garland are made from natural corn leaf and loofa, and can be hung on the cage to make an exciting toy which can be punched, pulled, chewed and bashed. The Toss ‘n’ Treat is another loofa toy but this one has small holes which you can tuck their favourite munch in to give a fun treat toy. The last new item from Boredom Breaker is the Toy ‘n’ Treat Holder which is like a little garden, holding three wooden carrots that are great for chewing, and a central dish that you can fill with all sorts of treats for your pet to enjoy. You can also get spare carrots to refill the holes once your pet has done enough damage to the supplied carrots.